Easy way to increase referrals, whitening AND other treatment! The other day, my daughter ran into Office Depot for me to grab a few items we needed at the office. 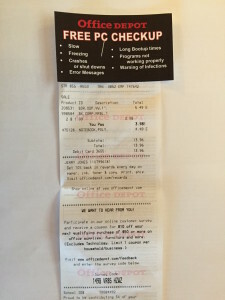 When she got back into the car and handed me the receipt, I was immediately struck by the very simple and smart way the clerks at Office Depot had created an opportunity for me to come back and buy more. Cool way to generate more business from customers or patients who have just checked out! Do you see the free offer STAPLED to the top of the receipt? I can’t miss it and didn’t. Neither would you. Most smart business owners know the best time to get a referral and get someone to spend more, is immediately after a purchase. That’s when the romantic glow – if there is one generated by your business – is strongest with buyers…right after they’ve just spent a few dollars – or in our case at the dental office, perhaps a few thousand or more. That’s when buyers/patients are most engaged with your business, too. The memory is still fresh. The paint still shiny. The feeling you gave them, still strong. And, that dear reader, is when you must strike to offer them a “next chance” to repeat that feeling. And, if you’re doing “it” right, they will react when you give them the opportunity to invest more and be more engaged with you – their friends and people they like! In the above example, while the “next” service you might engage Office Depot with is free of charge, what are they really angling for? They want you to invest in your next computer! Or better still, computers! Would an offer for a FREE cosmetic consultation on a business-sized card stapled to every patient’s day ledger as they leave, get you any business? What if the providers had all talked that day to the patient about straightening their teeth and that business card was a free ortho consult? What if you had 4 or 5 different cards, with similar designs but unique offers, just for the specific treatment that was discussed or recommended? And, that particular card went to anyone who DID NOT SCHEDULE — stapled to the top of their check-out ledger? What would happen if only 1 in 100 took advantage of that? Would that be ok? The cool thing is, they’ll pack that ledger receipt around with them. It’ll go home. It’ll sit on the counter. It’ll haunt them to throw away a 5% savings on work they know in their hearts they should get done. It’s like you’ve purchased real estate in their life and it’ll constantly hound them…In a positive way! You’re basically lighting a fire under their rear-end to get the treatment done sooner rather than later or not at all. Do you see what’s happening? You’re using existing, nearly FREE ways to generate additional revenue from people who already have given you the BIGGEST vote of confidence: They just spent money with you! There are dozens of ways like this you can leverage to make more with less expense in your practice if you just focus and think them through. I’d love to hear from you and get your comments.